Be adventurous with your next burger recipe! 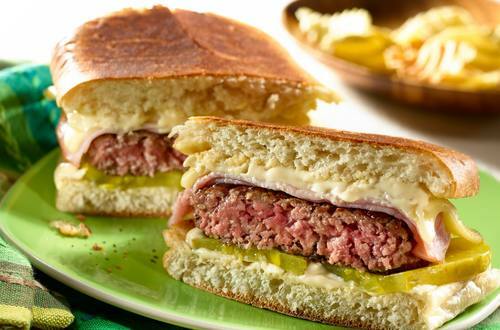 Follow this simple guide to creating Cuban burgers, packed with all sorts of appetizing toppings. 1 Combine Hellmann's® or Best Foods® Real Mayonnaise with mustard in small bowl; evenly spread on rolls. 2 Arrange pickles on rolls, then top with burgers, ham and cheese. Top with roll lids. 3 Wrap each burger tightly in aluminum foil, then grill over low heat, pressing with heavy skillet and turning once, until heated through and cheese is melted, about 7 minutes.